In Soviet Russia…you use whatever is at hand. When you can’t go back to base for more machine gun ammo belts (or pans for your DP-28) without running the risk of a Commissar shooting your head off with a Nagant revolver, you will do anything with anything at the front. These Russians have probably learned to oil the Breda if they are already in battle using it (maybe Marco got tortured for info). Either that or poor Sergei mashed his fingers trying to maintain the thing. In any case, the Breda 37 is certainly a heavy hitter and one I would not try to bum-rush without a tank, machine gun, or sniper team. I haven’t found performance figures of the Breda 37, but I’m sure hiding behind pine trees won’t help me avoid getting drilled by 8 x 59 mm RB Breda. 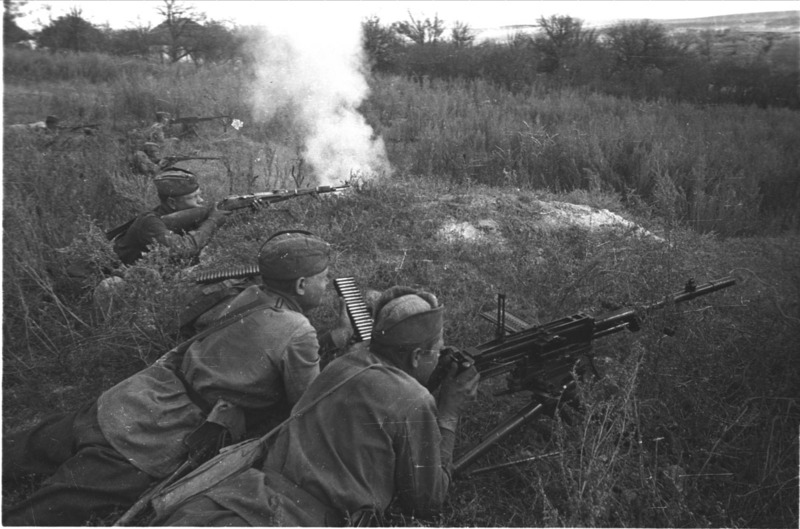 In 1941 Soviet Union had serious shortages of machine guns. During the Winter War DS-39 prove to be not enough reliable weapon, so production of Maxim 1910 was resumed. Some of SVT-40 was produced in full-auto variant called AVT-40. I believe there were full auto Simonovs too. The gun uses ammunition very similar to our [i.e. American] own with the exception of the case which is shorter and the caliber which is .015 of an inch larger. It is made in ball, tracer, and incendiary tracer armorpiercing. The German 7.92-mm ammunition can also be used. *This information has not been checked by U.S. test. Did you know that every case is reinserted in the clip after firing? ( wikipedia) Why? Did the italians want a tidy battlefield?… Seems pretty stupid…. Perhaps so… Brass ammo glints and a pile of empty cases can give away a well-concealed MG position, no? Perhaps they recycled even then! I always thought an undiscussed issue with lacquered steel cases was to make the cases drab colors like gray, brown, olive green, etc. I know at Stalingrad during the onset of Operation Uranus that the Italian expeditionaries and the Romanians got pretty roughly handled. Guys, I read a British book about machine guns and the author stated that the empty cases in the Breda’s trays were to be shipped back to the factories so that the cartridges could be reloaded. So David’s guess is right on the money! If I were low on brass, I’d have to recycle empty cases so I wouldn’t have to break out the old muzzle-loaders (by which point I’m screwed). And by the way, if you were using the Breda 37 as an improvised vehicle mounted weapon (many units, Italian and British Commonwealth, did this), you would not like to have hot brass flying around and getting underfoot. Has anyone experienced tripping on spent cartridge casings during a truck-mounted firefight on the desert road? I hope not! What was the name of the book and what was the author’s source? The World’s Great Machine Guns, written by Roger Ford. I haven’t the foggiest idea where he got the information, as he didn’t cite sources. However I’m pretty sure Ford is not merely making wild statements, as he wrote for several military-related publications. Medium machine gun feeded by 20 rounds charger? Try to imagine Browning 1919 MG feeded by 20-round box magazine for BAR – pure non-sense. This feature have some sense in tank machine gun, but Italians in Breda Model 38 (tank derivation of Model 37) lacks this feature and has top mounted box magazine for 24 rounds, so for example FIAT M11/39 tank have twin hull-mounted MG to solve problem with real-life rate of fire. For comparison: Soviet DT tank machine gun has pan magazine for 63-rounds, British BESA tank machine gun has belt for 225-rounds. As I understand it (according to such sources as Smith’s Small Arms of the World and Chinn’s the Machine Gun), the reinsertion setup was considered simpler and more mechanically reliable than an ejector. Also, for vehicle-mounted applications crew safety was a consideration; at one point the M37 was considered as a flexible observer’s gun for aircraft such as the Breda 65, and they were worried about ejected casings damaging parts of the fabric-covered fuselage, especially the tail. In the end, they concluded that this wasn’t as big a problem as they’d thought, and also concluded that even the powerful 8mm round wasn’t quite up to the requirements of modern air combat; they adopted a Fiat-made copy of the Browning M2 in 12.7mm, much as the Japanese Army and Navy did. As John Weeks related in Infantry Weapons (Ballantine, 1975), while this worked just fine in temperate climes like Italy, in colder regions you had to be careful about which type of oil you used to avoid freezing. And in sandy areas like North Africa the oil collected windblown sand and grit, and after a few strips had been run through the gun in a firefight, the effect on the chamber was rather like a high-speed valve grinder wielded by an overenthusiastic apprentice. In reading the manual for the 20mm AN-M2 aircraft cannon linked here a few days ago (thanks, Ian!) I noticed that it states that all rounds must be “lightly lubricated” before insertion into the link belt for it, as well. So the “other side” weren’t the only ones who had this problem. Can anyone post a manual of Breda model 37??? There seem to be several conflicting reports about the general performance and reliability of the Breda Modello 37 MMG. It has been stated by more than one source ( such as Arthur Swinson in “The Desert Raiders” ( Ballantine Books, 1968 ) that the LRDG in the Western Desert actually preferred this weapon to their own Lewis 0.303″ machine guns when they could capture the Breda along with sufficient quantities of its ammunition. Of course, there may have been other extenuating reasons as to why this may have been so. Still, by these accounts, the Breda, in spite of its need for cartridge oiling and the limitations of the strip feed, was over-engineered and apparently proved extremely robust and reliable under the harsh conditions of the Western Desert campaigns. 1. The early Italian tanks ( especially light tanks ) were small vehicles where usable internal space in both the driver’s compartment and fighting compartment was at a premium. Setting up the tank’s MG’s for a belt-fed system along with a large capacity cartridge collection bag would have severely reduced that already limited space to the point where it would have interfered with the crew’s ability to function efficiently. The combination of a relatively short overhead magazine and compact cartridge collection bag was probably seen as an acceptable solution to this problem, lateral room being less available. The trade-off was the need to frequently change magazines and empty the cartridge collection bag ( preferably outside the vehicle, with consequent partial exposure of the crew ). It should be noted that the early tanks had open raceways in the turret ring that were vulnerable to jamming by foreign objects, stray shell casings included ( not a good thing to have happen in the middle of a battle ), hence the need for the cartridge collection bag. 2. The Modello 37’s strip feed / cartridge collection system would have made sense for armored vehicle use since it simultaneously eliminated the problem of emptying the cartridge collection bag, the added bulk of the bag ( particularly when full ) and the hazards of foreign object damage, but the trade-off would have been loss of lateral space and vulnerability of the strip feed to mechanical damage. Weren’t the Italian light tanks basically a Carden-Lloyd Bren Gun Carroer with overhead protection? They seem to have a similar suspension, at least. The World War Two Italian light tanks were not exactly a Bren Gun Carrier with fully-enclosed armor protection ( and a revolving turret ), but you aren’t too far off either! The similarity in suspension is coincidental, as some models of armored vehicle from different countries ( and of otherwise entirely different design ) often shared some physical similarities due to the existing technology of that period. The Italian light Semovente’s were definitely much larger and heavier than a BGC, and also much more heavily armed and armored ( this was all relative, of course, since the Italian tanks proved generally inadequate in battle versus their Allied opponents ). There is a web site called http://www.wwiivehicles.com ( plus links, you’ll have to explore a bit ) where you can begin looking up the wide variety of Italian ( and other ) vehicles ranging from military trucks, tankettes, armored cars and light tanks to medium and heavy tanks, SP guns, tank destroyers and SP howitzers. The Italian vehicles, in particular, are fascinating, partly because of their different — and sometimes esoteric — designs, and because they are largely forgotten or neglected. In fact, I’ve found that the greatest concentration of interest in Italian AFV’s of the period lies within the modeling / diorama community, and the positive side of this is that the drive for authenticity usually ensures that the information provided is detailed and accurate. Hope you enjoy the site and surfing the links! Here’s another informative web site on Italian AFV’s — http://www.desertwar.net. Hope this helps a bit too. Well said, Earl. There is, however, one Italian armored fighting vehicle of the period I’d hate to have attacking me: The Semovente 90/53 long-range tank destroyer, pretty much the “sniper” of Axis tank destroyers in the North African Campaign, where Allied tanks could only pray that it missed them since they would be unable to match its long ranged 90 mm gun. Excellent point, Andrew — I had almost overlooked this TD! The Semovente 90/53 was both powerfully armed and potentially deadly, definitely not an opponent to be trifled with, and yet, like so many Italian AFV’s, almost ( and unjustly ) forgotten today. Thanks for the reminder — perhaps we could, as a website, try to keep this and the history of related Italian AFV’s alive in the interests of posterity? After all, they are “forgotten weapons”, while not being exactly small arms. Of course, Ian M. would have to have the final say on this topic since he would be in the best position to make a determination. All this talk of oiled cartridges, yet in the video by AZ Guns his Breda M37 runs just fine with dry cartridges. Ian needs to get to the bottom of this.